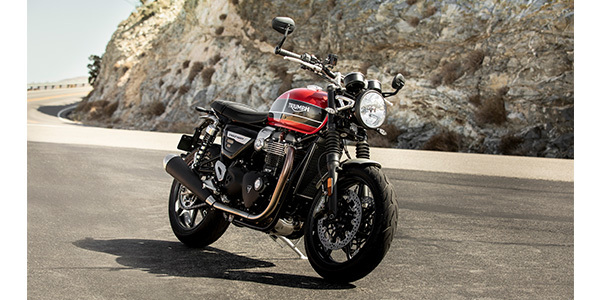 The new 1,200cc Triumph Bonneville Speed Twin proudly re-introduces a legendary British moniker to the world in a machine truly worthy of the iconic Speed Twin name. A performance motorcycle that sets a new benchmark for how a custom roadster should look, ride and feel, the Speed Twin offers class-leading handling, advanced rider tech and style. For 2019, the all-new 1,200cc Speed Twin re-introduces this illustrious Triumph name to the Modern Classics line-up. The brand new Speed Twin carries all of the contemporary custom style of the Street Twin, but adds even more premium details. It delivers the power, torque and technological advancement of the thrilling Thruxton R, with the confidence-inspiring ride and all-day comfort of its renowned Bonneville T120 sibling. The all-new Speed Twin boasts class-leading handling characteristics, for a precise, agile and dynamic modern roadster ride with Triumph’s trademark intuitive feel. The dedicated new frame developed from the Thruxton R delivers comfortable and engaged ergonomics which, combined with the high specification cartridge front forks and twin rear suspension units with adjustable spring pre-load, make for a truly confidence-inspiring performance machine. High specification twin Brembo four-piston axial calipers on the front and a two-piston single floating caliper on the rear provide excellent stopping power, complementing the motorcycle’s modern roadster character. The modern roadster character comes to life through its 1,200cc High Power eight-valve, parallel twin Bonneville engine, specifically updated for the new Speed Twin. This revised high performance engine features a low inertia crank and high compression head developed from the Thruxton R’s renowned powerplant. Together these deliver a unique 5.5 lbs. weight savings versus the Thruxton engine. With 96 peak horsepower at 6,750 rpm, the new Speed Twin achieves an impressive 76 percent increase over the 2018 Street Twin and 49 percent more than the new 2019 Street Twin. Additionally the new Speed Twin engine also delivers a strong peak torque figure of 83 ft.-lbs. at 4,950 rpm – 40% more than the 2019 Street Twin. Behind the classically stylish exterior sits a modern liquid cooling system, carefully integrated to minimize its visual impact while achieving clean emissions and enhancing fuel efficiency. Combined with an extended first major service interval of 10,000 miles, this contributes to a reduced overall cost of ownership. Designed with personalization in mind, the Speed Twin comes with over 90 accessories to help riders add even more style, practicality and security.